The weather never takes a holiday and neither does Impact Roofing. 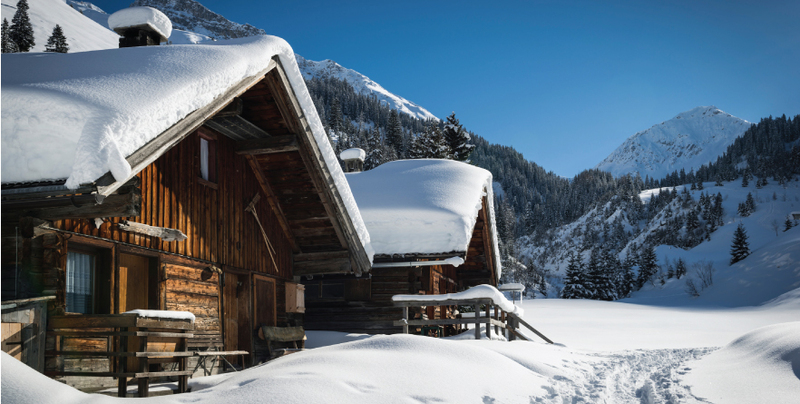 Roof leaks and damage caused by excessive snow loads can happen any time. Impact Roofing is a licensed general contractor that you can rely on if you should need a rapid response team. We have experienced roofing repair crews, right here in Colorado. Many are right next door to you and can be at your roof in 3 hours or less, even during the holidays (weather permitting)! For emergency roofing repair service in your area, contact Impact Roofing today and discover why many of the local homeowners choose us to fix and repair their roofs. For many people in the U.S. winter is already here. Snow has already fell in Colorado and currently falling across the Midwest and is also forecast for the Northeastern US in the coming days. Despite the forecast, proactive facility managers and building owners who already have their snow removal contingency plans in place are breathing a sigh of relief. These decision makers recognize the importance of ensuring their commercial properties remain safe places to do work, shop, or store goods. They also know failing to remove snow from the roof can lead to disastrous results. Just how disastrous? As the structural integrity of roofs deteriorate, the chances of collapse due to snow load inevitably grow. When a building’s roof finally does give away to the pressure of the snow and ice, the effect on people and the local economy is immediate and widespread. According to the Insurance Information Institute, in 2015, snow events, blizzards, and winter storms were responsible for an estimated $3.5 billion in insured losses (residential and commercial) with many of those claims linked to damage caused by collapsed roofs. FEMA says there are many factors that go into “snow-induced structural failures,” including a roof’s shape, slope, construction, maintenance, exposure to wind, and the type of snow that has accumulated. Before embarking on a potentially risky mission of removing snow from your roof, determine whether it’s necessary. For example, homes built before 1975 may not be structurally sound enough to handle the amount and types of snow being dumped across the U.S. this winter. 2. Calculate the weight of the snow on your roof. Ten inches of fresh snow equates to about five pounds per square foot. 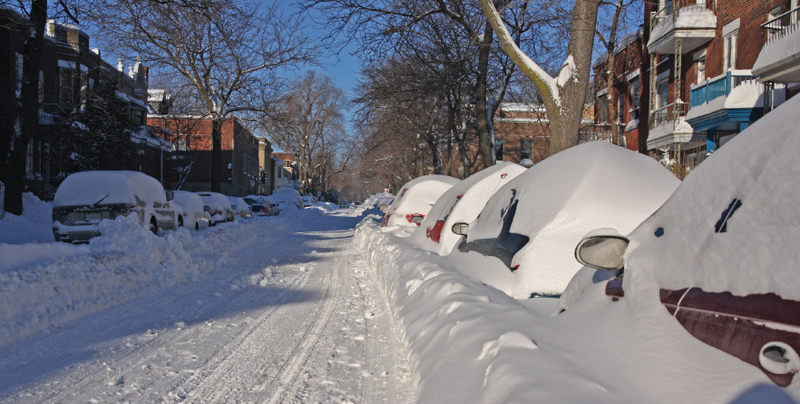 Packed snow, weighs more: two feet or more of old snow is enough to exceed weight limits. Just two feet of each could collapse a roof. And don’t forget to add ice to the equation. An inch of ice is equal to the weight of a foot of fresh snow. 3. Remove excess snow and ice. Hiring a professional contractor like Impact Roofing to remove the snow and ice for you is recommended by FEMA due to how dangerous it can be. These contractors have the necessary equipment to do the job safely. If your roof is damaged and looks like it’s in danger of collapse, do not risk staying inside or attempt to clean it. Evacuate the premises and contact a structural engineer to assess the problem. Impact Roofing is a licensed general contractor and specializes in structural issues. Different regions typically produce different types of snow. Western regions often produce lighter, fluffy snow (that powder skiers and snowboarders rave about), whereas Eastern regions often accumulate heavier snow. Roofing is dangerous work. Injuries on the job can create staffing shortages and other HR headaches for roofing subcontractors. Lucikly, the U.S. Department of Labor’s Operational Safety and Health Administration (OSHA) provides guidance on how to avoid safety disasters on construction sties, particularly those relating to falls. Check out the infographic below for more details on OSHA roof safety. Checking your Roof before Christmas! Everything is ready for Santa, all the guests are here, lots of delicious food in the oven, cooking up a storm for the big feast of Christmas Day. Presents neatly wrapped under the beautifully lit tree, and then what? A roof leak?! The last thing anyone wants to worry about is a leaking roof! Here’s the 411 on what to look for, what to do, and how to prevent such a scenario! Stains on your ceiling can indicate that water has leaked under your roof shingles and made its way into the interior structure of your homes. This can occur from roof damage or basic wear and tear. If those stains have been there for a while though and you are certain they do not indicate imminent problems, keep in mind that they can still cause mold growth. As soon as the roof on your Colorado home has a couple of missing shingles or a few loose ones, it is important to have them replaced sooner rather than later. In addition to the possibility of a leak, you could also end up with a cold, drafty house that won’t make your guests feel very comfortable. You should also have shingles replaced if they are deteriorated, dented, or torn. If you’ve seen signs of granules in your gutters during recent storms or granules on the ground near the downspout, you’ll need to have your roofing shingles checked. Over time, the granules on shingles can come off which leaves the shingles exposed to harsh sunlight. This can weaken them and increase the risk of your roof leaking. Water leaking into your home during your holiday feast or while you’re all gathered around the tree singing carols is something all hosts would like to avoid. Look around your property for blown off shingles or flashing. With the high winds we have here in Colorado, this can cause old shingles and roofing material to blow off and land in your yard. Keep an eye out for felt paper, shingles, or metal flashing. 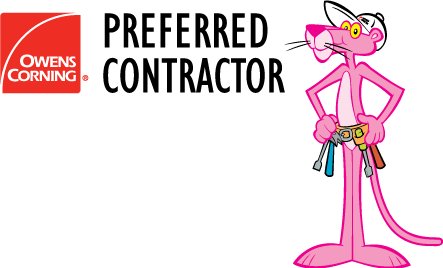 Keep in mind that if you need emergency repairs this holiday season, Impact Roofing is the company to call. Our roofing professionals can handle urgent roof problems and do all repairs quickly and without leaving any mess behind for you to have to deal with. You can rest assured that with Impact Roofing your Coloradan holiday festivities can proceed as planned. Call us today if you are unsure! We can inspect your roof before Santa and the guests arrive to insure you are not going to experience a leaky roof during the Holidays. Jeff at 719-220-0169. Small Animals Can And Will Damage Your Roof. Was To Protect Your Roof From Their Damage! The weather is getting cold outside and small animals are looking for a warm place to hibernate. Impact Roofing has had to repair several roofs this month from small animals making their way in through the roof ventilation or chewing there why through a smaller hole that was in the roof. 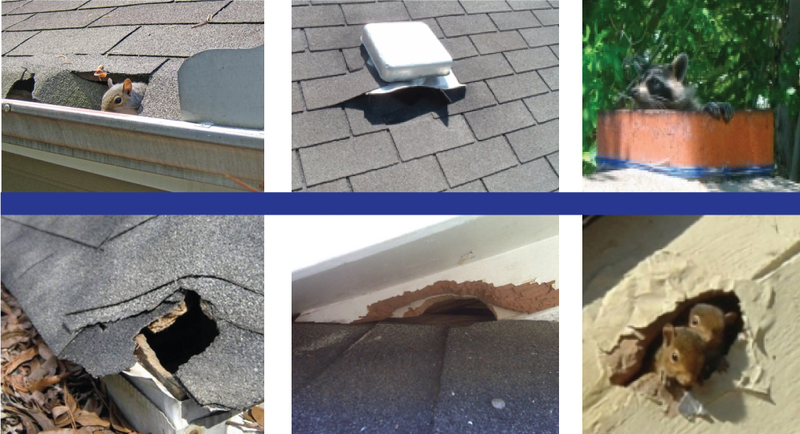 Roof damage from animals is not only possible, it is a definite threat.. If you suspect damage from small animals in your roof our attic contact Impact Roofing and we will send a professional out to take a look. What Types of Animals Invade Roofs? What Kind of Roof Damage Can They Cause? Animals commonly enter roofs through the soffits and soffit vents. They chew and tear at the surrounding material until enough space has been made for them to squeeze inside. They might also remove shingles and make their through rotting wood to gain access through a chimney or gutter. Larger critters such as raccoons may be deterred from entering through fans or vents, but small rodents can easily overcome obstacles in their quest for a warm, dry nesting place. Once an animal has made an entrance hole, other animals can find a way inside also, plus water can find it’s way in that same hole, which will saturate wood and may cause serious mold and damage. Birds will use a section of the roof or attic as their nest, but once inside, they can destroy the electrical wiring and venting systems. Rats, mice and squirrels instinctively gnaw on wood and wiring and causing further havoc. Trim all tree branches away from your home. Branches too close to your home is are a common way for animals to climb onto the roof’s surface. Clean debris from gutters regularly to deter birds from nesting in the space, preventing proper water drainage. Inspect your attic’s interior on a regular basis, looking for droppings, gathered nesting material and signs of a frequently used animal entrance. Walk around your home and inspect the perimeter of the roof from ground level and look for missing shingles or torn roofing materials. Call a Impact Roofing if you see any type of interior or exterior roof damage. 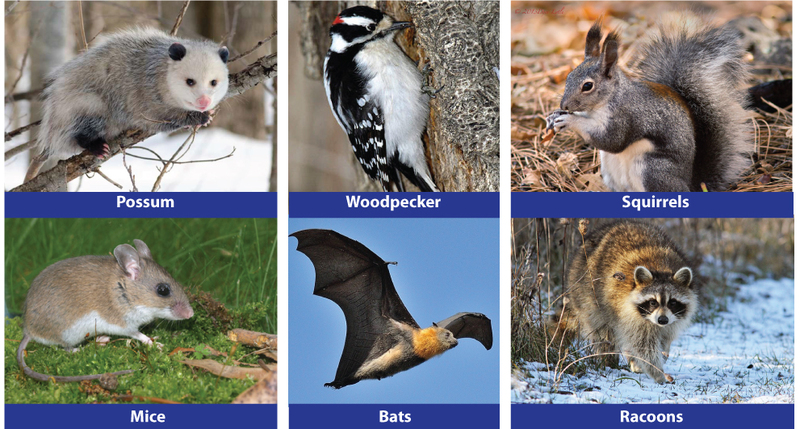 If you can see and hear a critter in your attic call animal control to safely remove the animal first.